All the romance of a fairy tale swirls around the announcement of your special news on this wedding invitation inspired by Disney's Rapunzel. To top off the look, a swirling Rapunzel flower design, also featured in the Tangled Disney movie, is printed in the circular frame that crowns your wording on this white invitation. Your wording is printed in your choice of up to two imprint colors and two lettering styles. 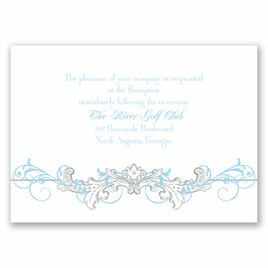 The swirling border and design are printed in the same color you choose for your wording. Bright white inner and outer envelopes are included. It took me months to find the perfect wedding invitation with the perfect shade of purple and I finally found them with Fairy Tale Filigree Invitation - Rapunzel. When I received them, they were everything I hoped for and it really envisioned my theme for my wedding. It was a bit pricey since I did not order a huge amount, but luckily I got a decent discount so it wasn't so bad and it was completely worth it. Shipping and delivery was so fast so that was a plus. I was absolutely satisfied with my purchase, no mistakes found whatsoever either! The only con was I didn't realize there was a separate inner (w no gum part) and outer envelope for the invitation so I started addressing the inner envelopes which made me end up wasting some envelopes but luckily I ordered extra. It made a lot of sense to have two envelopes though as the outer envelope is super thin so having the inner envelope really makes it feel more formal. I think the inner envelopes (although one set did have a label on it and the other didn't) should have been on top of the outer so it's less confusing. Overall, really satisfied and highly recommend! The invitation is elegant and pretty. The color in the online picture is very close to the color in person. Although the invitation is pretty, I don't think it's worth the outrageous price. I won't be buying these invitations.